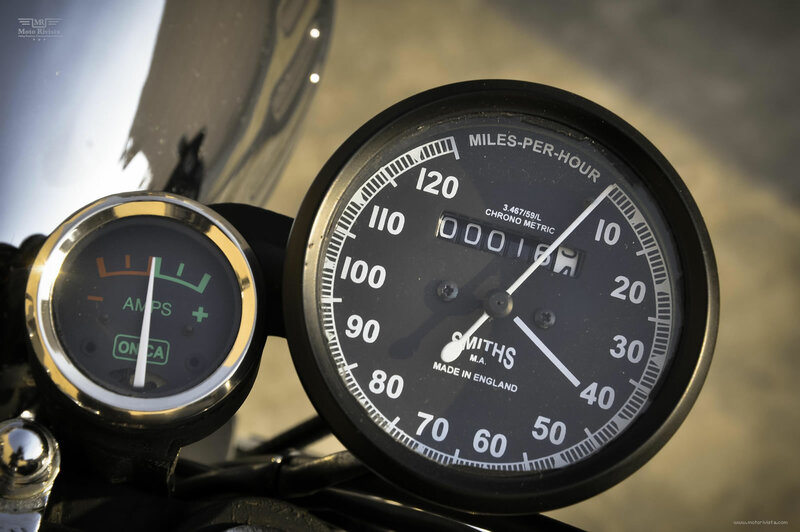 With a population over 1.2 billion India has to be one of the biggest motorcycle markets in Asia, yet only a handful of motorcycle manufacturers have been investing into the Indian Motorcycle market. Times are changing because India is changing and demanding. The youth in India has had enough of the Indo Jap mixed stock bikes. It’s time for a change and that change comes from a long held desire. 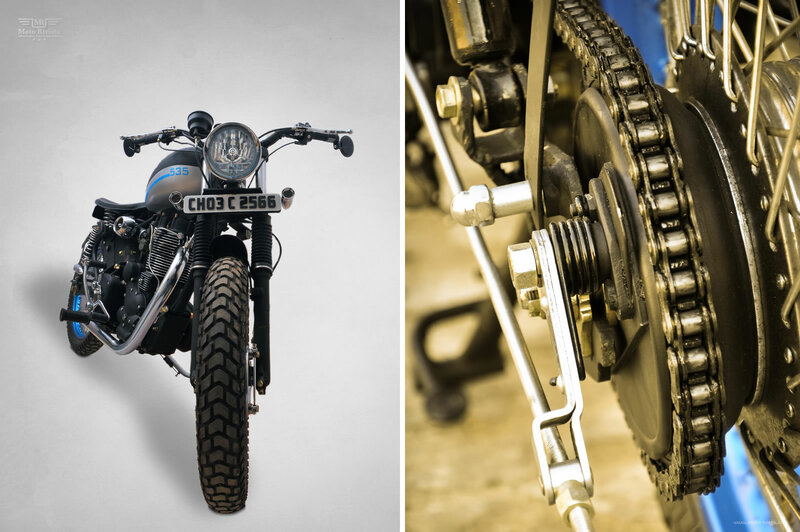 Recently we have featured 2 other modified Royal Enfield’s from India. Today’s feature build a Royal Enfield custom aka 535 Panj so Penti is from S2 customs, and is further evidence the custom scene in India has started flourishing. 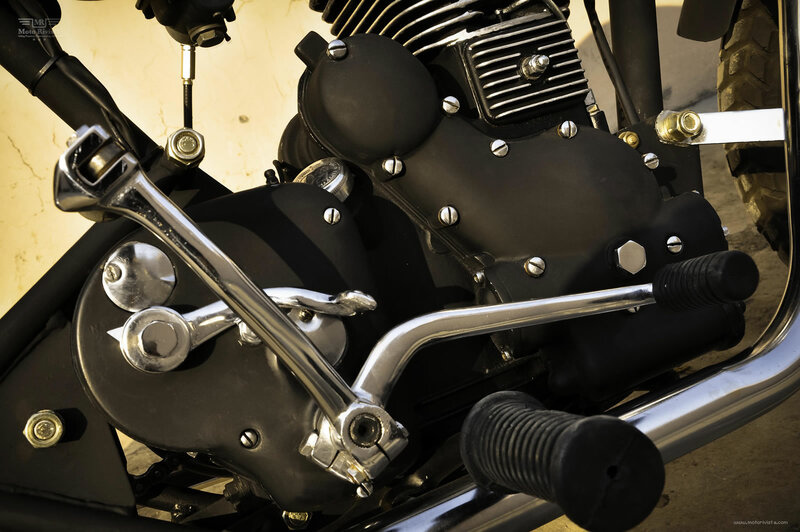 When it comes to customizing motorcycles in India the Royal Enfield has to the first choice, Royal Enfield has been a reliable motorcycle for Indian motorcycle enthusiasts and it’s Army for decades. 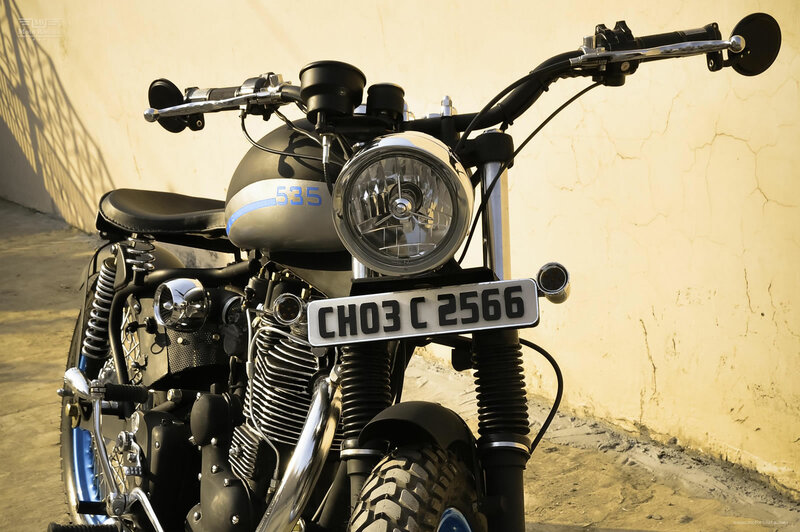 This Royal Enfield 535cc is a good first attempt from S2 customs. Lets take a look at Indian metal fabrication history. You might be surprised to know that the art of metal work in India dates back 4500 years. The beautiful image of a dancing girl from Mohanjodaro bares testimony to this fact. Some of you may heard of the great Damascus sword, what you may not know is that Damascus steel was created from wootz steel, a steel developed in India around 300 BC. Back to the feature of the day, Manmeet tells us “ Born and raised in the Doaba region of Punjab (Jalandhar), this is my first project and I teamed up with my dad. We had been discussing machines ever since I was a kid and one day we decided to start up a custom motorcycle shop. We started the shop to beat up the metal hard enough to hear the thump out of it. We will be working on donor bikes from clients as well as our shop owned bikes. The base for this build was a stock 2000 Royal Enfield 535cc. It took us around 2 months to complete as it was our first build. The team involved for the build was a fabricator/metal worker, a mechanic to take care of the mechanical work and I did the visualization of the bike from the fabrication to the paint job to the final renderings. The modification work includes 72 spoke rims wrapped in Pirelli tyres. 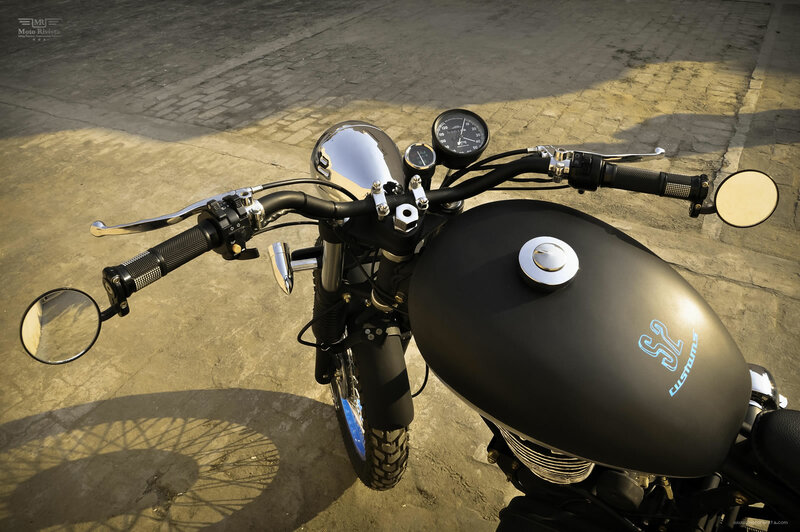 At the front this Royal Enfield custom features a one-off handlebar, Tri star headlight, pair of LED indicators and a single saddle seat. We have also added handle mounted rear view mirrors. 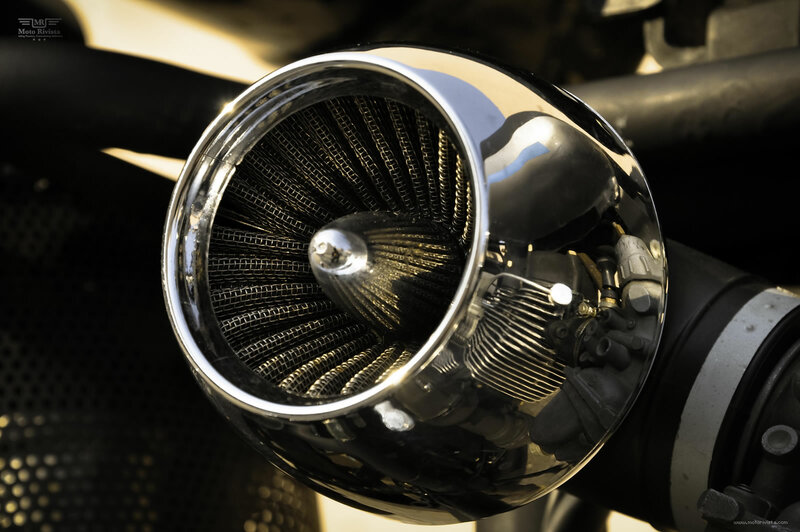 The engine had been fitted with a performance air filter. Whilst other modifications includes a custom battery case with ignition switch. The biggest challenge was to get the rims painted and re assembled, as these are not the regular ones which we find in the Indian market these days. For these I found an elderly retired rim specialist and convinced him to assemble the rims perfectly. My favorite part of this build are the rims off course, I also like the headlight, rear view mirrors and the engine, which looks fab after the paint job and the nickle screws”.